Coins of Time does not have inventory available at this time. 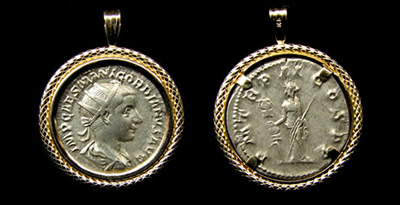 The ancient coin jewelry is designed to European standards. 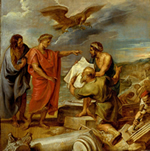 Each ancient coin has guarantee of authenticity. If you have any questions, I am happy to answer them. Please email me at spqram@yahoo.com. On occassion we have availaible a selection of coins set in gold pendants. These fashionable items can often be purchased with gold chains of various styles and lengths. 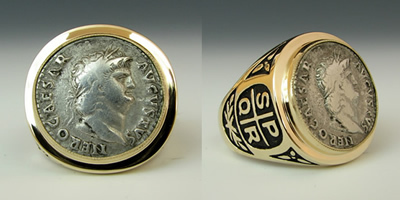 Here are a couple of examples of our beautifully customized silver and gold rings with genuine ancient coins. 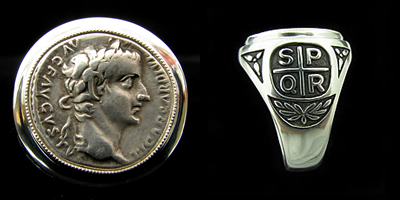 Our rings feature the great figures of history: Marc Antony, Tiberius, Nero, Trajan, Constantine the Great, and others. We offer a variety of ancient coins from Greece, Rome and the Holyland. Our coins come mostly from auctions and private collections. Many coins make cherished gifts as most people have never physically seen an ancient coin let alone owned one. Click here for selection.